International Money: Big-Government Solution or Trust and Honesty? Robert Zoellick is back in the news with advice about international monetary policy. His Financial Times commentary starts out with the admission that "[n]ew agreements may be in short supply when finance ministers of the Group of 20 heading economies meet this weekend in Paris." Paradoxically, he ends up his commentary recommending that the G7 should "issue a statement to reflect" ... the "agreement" "establishing an important norm: to maintain flexible exchange rates, without intervention, unless the group agrees special circumstances warrant action." I guess he thinks agreement is more easily reached among seven than among twenty. As to be expected from someone who is the acting President of the World Bank Group, he recommends that an international agency, specifically the IMF, should act as a "referee, able to blow the whistle on the appropriateness of external policies" of nations, with the IMF having no power to "impose penalties." Right. That should work, just like it has in the past ... Oh, that's right, it hasn't. But that doesn't prevent Zoellick from advising us to expand the IMF's responsibilities even more. They should also "sharpen the multilateral review" of certain policies, which review should "compare national policies with international information indicators, including commodity prices such as gold." At least he got that right. He goes on to list a few more ideas of how a world agency such as the IMF and the WTO could, by working together, offer incentives or disincentives to world governments. I suppose two international agencies is better than one. I say, Good luck. The Case for Gold is now being re-released by Mark Calabria, Director of Financial Regulation Studies at Cato Institute. Download it for free here. "Its authors argued that while persistent and high inflation, a weak economy, and high unemployment were the direct result of misguided Keynesian policies, the answer was not monetarism. For the basis of monetarism is still allowing a government monopoly on the issue of money. We have again found ourselves in an environment where both Keynesian and monetarist policies have failed us. The necessity for alternate options is pressing." "Paul and Lehrman remind us that when government has the ability to abuse our trust, as in the case of purchasing its own debt or debasing its currency, it will inevitably betray that trust.... The Case for Gold is the case for limited government, a case for applying the rule of law to our monetary arrangements, as opposed to the highly discretionary rule of man which now governs our monetary system. With the public's renewed interest in constitutional government, it is only fitting that such an interest extends to money." "Paul and Lehrman remind us that the ultimate purpose of a monetary standard is not price stability, but 'trust and honesty.'" 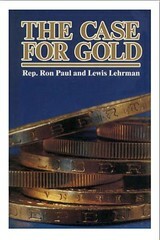 The American Institute for Economic Research held a symposium in May of 2004 on the very subject of resumption of something resembling the gold standard. The results are set forth in one of their booklets, available here. Contributing to the conference were Lawrence H. White, Anna J. Schwartz, Gerald P. O'Driscoll, Jr., H. David Willey, Hugo Salinas Price, John C. Hathaway, Michael T. Darda, Richard Sylla, Michael W. Crook, Robert E. Wright, and John H. Wood. Both works are an excellent read. Ben Bernanke: "Let Them Eat Cake!" "I think it's entirely unfair to attribute excess demand pressures in emerging markets to US monetary policy, because emerging markets have all the tools they need to address excess demand in those countries...."
I will not harp on the fact that I don't agree with Bernanke. First of all, no one really cares what I think; and secondly, I don't have the scientific ammunition to prove him wrong, even though evidence to the contrary is clear to me. C. An increase in the issuance of U.S. dollars without a corresponding increase in U.S. GDP may have an effect on foreign nations, but who cares. Bernanke may not have the gall to choose C, as did Nixon's Treasury Secretary, John Connally. Faced with a similar question, Connally is reported to have said: "[T]the dollar is our currency but your problem...." No, this would sound too flippant, too frank, and would not correspond to Bernanke's more academic, more convoluted style. So let's assume Bernanke has chosen B above. Bernanke doesn't seem to care that other countries may not have China's leeway. He explains, "They can, for example, use monetary policy of their own. They can adjust their exchange rates, which is something they've been reluctant to do in some cases." But ... isn't that illegal currency manipulation? In fact--isn't that what we're doing?? Oh well. I guess two wrongs make a right. 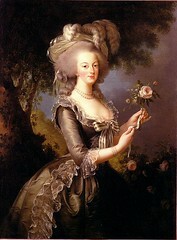 If you ask me, Ben and Marie Antoinette have something in common. It's called Hubris.